Early November is the Olive harvesting season. So I was invited by a good friend to visit their family Olive Groves near Ermioni, in Peloponnese Greece, in order to document this year's olive harvest and take some photos for their new website. Consider an area of 100 Hectares scattered with Olive Groves, up from the hills down to the seaside. Olives around you as far as the eye can see. I picked a spot on top of a hill with a panoramic view of all of the property. A magnificent view overlooking the bay of Hydra in the eastern Peloponnese, Greece. A clear view of the city and port of Hydra on the opposing island. Although this year is considered a low yield year, the branches are full of ripe olives. Ripe Black Olives of the Manaki variety ready to be hand picked. Olive harvesting in this property is done by hand in order to avoid any damage to the olives or the twigs. Pointed ladders are used to penetrate the tree branches, where even the topmost olives are hand picked and dropped on a large hessian cloth placed around the roots of the tree. 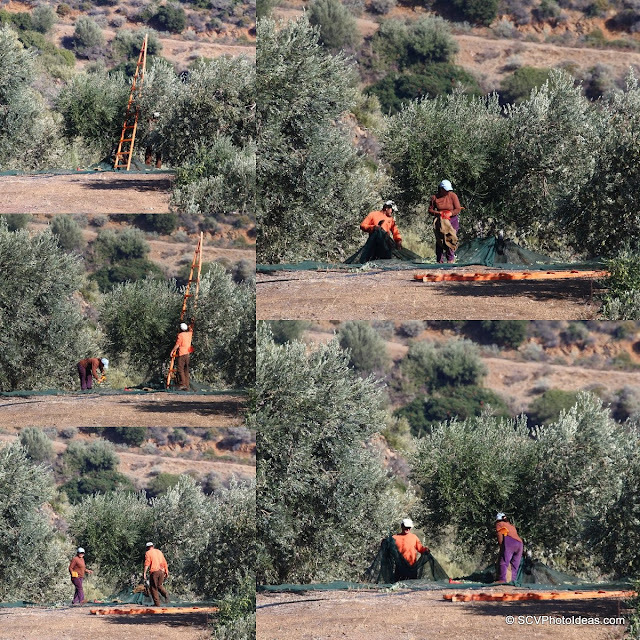 When all the olives are picked the cloth is rounded up and pulled in gathering all olives in the center.